Deng Xiaoping was famous for chain smoking Panda brand cigarettes, but if he was still around he'd be disciplined and subject to "criticism from the masses" under new regulations that require all Party officials to set a good example in fighting the "evil influence" of tobacco. A new directive from the Communist Party Central Committee Office and the State Council orders Party members and government officials ('ganbu') to take the lead in enforcing smoking bans in public areas, government buildings and also during government business. 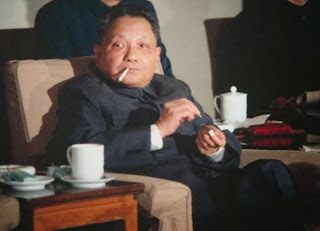 Officials are expected to act as model examples and to strictly uphold no smoking policies to maintain the image and reputation of the Party, the edict states. The directive orders pubic officials to take serious note of the importance attached by the leadership to the non-smoking policies for public areas. As well as setting an example by refraining from smoking themselves, officials are also expected to actively implement and monitor programmes to enforce the smoking bans. The no-smoking policies apply to public areas in schools, colleges, sports facilities, and cultural venues, as well as transport facilities such as airports. Officials are ordered to ensure that No Smoking signs are displayed prominently and that bans are actively enforced. Government officials are also expected to ensure that no smoking policies are implemented in government buildings - including areas such as corridors, bathrooms, stairways, reception halls and canteens. The directive also forbids officials from smoking while on government business and from offering or supplying cigarettes to others or encouraging others to smoke while on government business. Officials "at all levels" who fail to observe the new rules will be subject to disciplinary action and undergo criticism, the directive says. Officials can also expect to be subject to the 'supervision of the masses and public opinion", it warns.